Bridgett Rowley (Founder) & Kelly Barnes (Co-Founder) started the Canines & Couture pup fashion show five years ago. Bridgett adopted Scarlett O'Hara after she was rescued from a North Carolina puppy mill. The purpose of the Canines & Couture pup fashion show is to create awareness around the lack of puppy mill legislation in North Carolina and promote animal adoption. North Carolina currently does not have a puppy mill law in place. Bridgett is the liaison between the constituents and the politicians. She disseminates pertinent information about the status of puppy mill legislation. Kelly & Bridgett are also on the committee for CARE (Coastal Animal Rescue Effort). They have helped raise over $200,000 over the past years. CARE helps animals in the community in need. Bridgett & Kelly have also donated to Furever Friends, RACE, NC Humane Society, Paws Place and many other rescue groups through the years. Kelly is heading up the merchandising line for Canines & Couture. This will enable them to help even more animals. Kelly launched the Canines & Couture merchandise line in 2017. Kelly brings over 25 years of merchandising and distribution experience to Canines & Couture. She has also served on many charity committees through the years. Kelly's philanthropy work combined with her astute business acumen makes Kelly a huge asset to Canines & Couture. Kelly will also continue to work on Bridgett's grassroots movement to stop puppy mills and promote animal adoption. Kelly was inspired to rescue other animals after saving her beloved Kava. Kelly rescued Kava after he was abandoned with his litter mates in the woods. Kava is living a very happy life now. Bridgett was inspired to start Canines & Couture after she adopted Scarlett O'Hara who was rescued from a North Carolina puppy mill. The first Canines & Couture event was a pup fashion show that was held in 2012 in Wilmington, NC. The show featured rescue pups and their owners strutting down the catwalk to promote animal adoption and create awareness around the puppy mill problem. 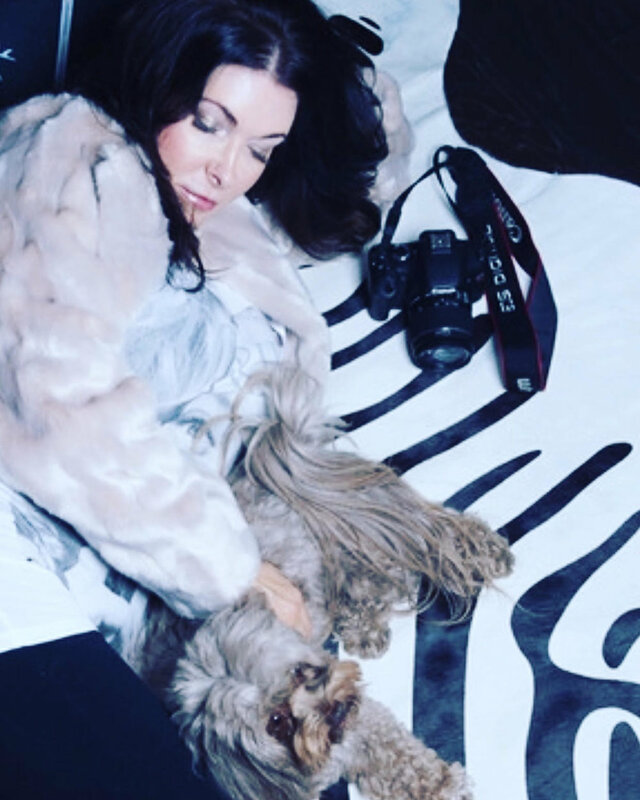 Bridgett's love for animals combined with her 20 plus years of design and marketing experience inspired the Canines & Couture Pup Fashion Show. There will be a Canines & Couture pup fashion show in Beverly Hills in 2018. The next Canines & Couture project was the "Real Men Adopt" calendar. The latest addition is the merchandising line which consists of hats, t-shirts, hoodies, socks & candles. The merchandising line will be headed up by Kelly Barnes. Stay tuned for many more pup saving announcements.